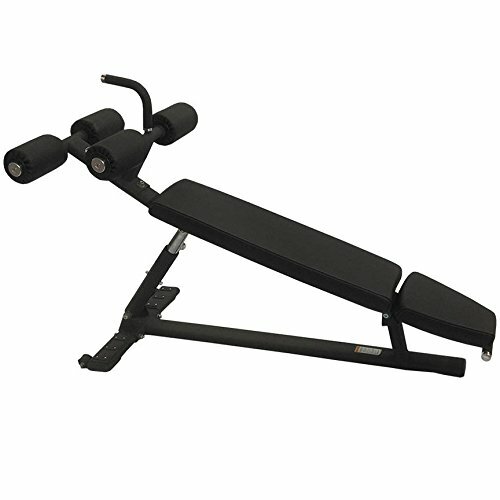 The X Series Commercial Adjustable Abdominal Bench (XAAB) from Torque Fitness offers the ultimate in See, Feel, and Trust - Visual Impact, Ultimate Comfort, and Bullet Proofing where it counts! What Users See: A visual connection to X Series commercial gym equipment through aesthetic style, color, and upholstery. A strong, sculpted look that signals quality construction and performance. Extended "like new" look and feel through durable pad technology and paint protection. What Users Feel: Ease of four angle adjustment from -10 to -25 degrees with simple spring pin mechanism. Increased comfort through large diameter roller pads. Easy entry and exit facilitated by molded rubber grip handles. Solid stability through non-skid rubber surfaces on all floor contact points. Ultimate stability option through permanent floor anchoring capability. What Users Trust: Durable construction through 1-1/2" x 5-1/2" 11 gauge flat oval tubing. Prolonged paint protection through high density urethane foot guards. Prolonged pad life through vinyl seams that are double stitched and strategically placed. A 30 year culture of long term durability and customer service.